The Northern Provinces branch of the South African Geomatics Institute (SAGI) held its annual general meeting (AGM) at Mount Usambara in Krugersdorp on 31 March 2017. 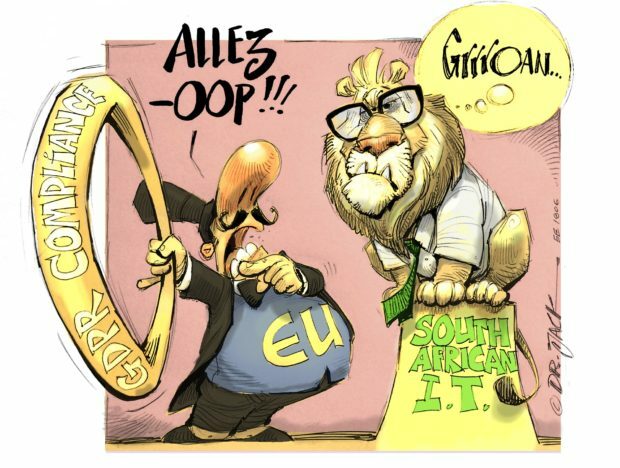 In his annual address, SAGI President Peter Newmarch discussed a possible process on how to determine guideline fees for geomaticians as outlined by the Geomatics Act, and reported on the new features of the institute website (www.sagi.co.za). This includes a continuing professional development (CPD) recording and retrieval system and a complaint ticketing/tracking system. 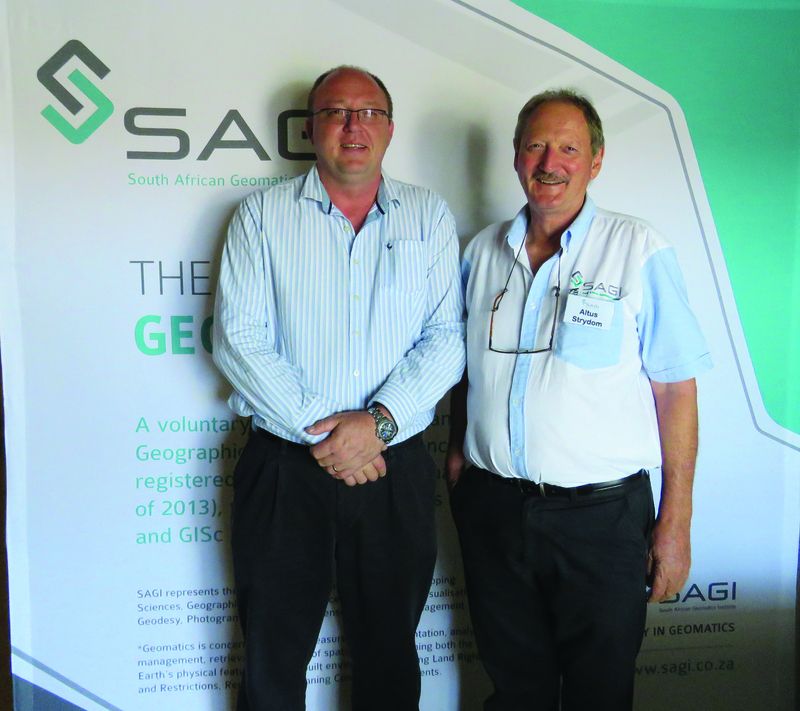 SAGI President Peter Newmarch and SAGI Northern Provinces chair Altus Strydom. 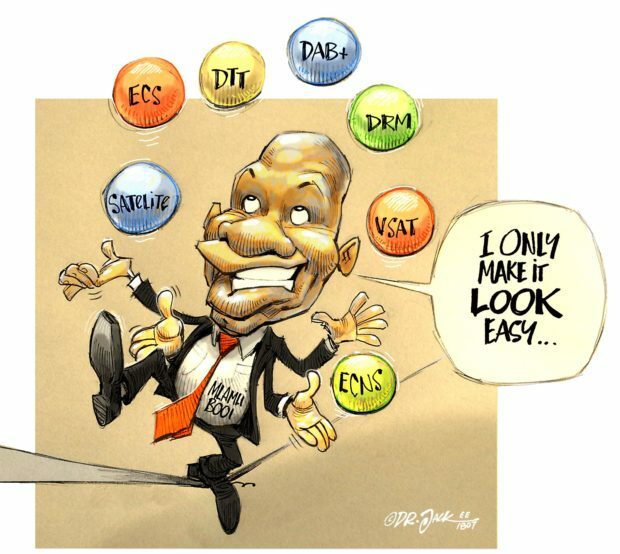 Newmarch also described SAGI’s new planning portal (www.planning.org.za) which will communicate information to the public about planning; provide SAGI members with planning examples and templates; and host information on the Spatial Planning and Land Use Management (SPLUMA) by-laws as well as contacts, forms and application fees. The portal is part of a wider initiative by SAGI to harness and exploit internet domains dealing with planning, property, engineering and GISc in order to get the public to associate this work with geomaticians. During his address, Newmarch stressed that SAGI needs to be active in education initiatives, and called on members to participate in mentoring and standard development activities, and to provide guidance on professional ethics. He stated that SAGI was funding a report on accredited on-line modules covering a range of subject areas, which would be recognised by the South African Geomatics Council for registration purposes. 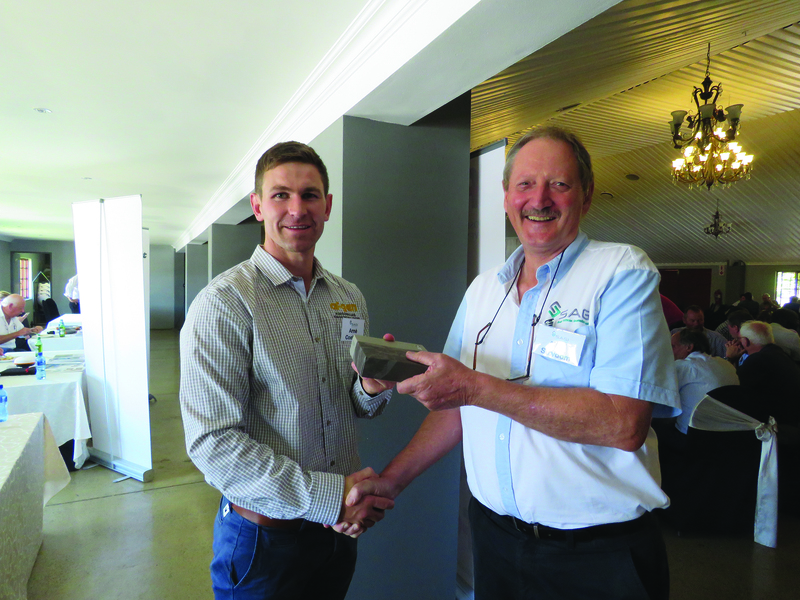 Following on from this was SAGI Northern Provinces Branch chairperson, Altus Strydom, who outlined how SAGI is working to develop a more effective management strategy for the benefit of members. He also provided details on SAGI’s compliance education campaign which has initially focused on drone operators offering mapping services and geospatial end-products, reminding them of their need to comply with civil aviation rules and the Geomatics Professions Act. Strydom called on SAGI members to market the profession and reminded them that marketing material has been developed by the branch and is available for members to use. Afgen’s Arné Coetzee receiving his gift for best presentation from Altus Strydom. Part of the proceedings also included some presentations by suppliers. The first of these presentations focused on SAGI-SURE, a professional indemnity policy, which has been specifically created for land surveyors and is endorsed by SAGI. The difference between professional indemnity and public liability was explained, and members were advised that it was also possible to get cover for their instruments. Pieter Otto from Aciel Geomatics advised surveyors to get more involved in GIS, and spoke about the GIS work flow chain and the difference between GIS and CAD. He was followed by Johan Kok from VI Instruments who gave a presentation on underground service detection and explained how to map underground services for maintenance and avoidance purposes. Dave Beattie from AutoBuild spoke about a new mobile mapping system for easy data collection and analysis, which can be mounted on vehicles, Segways and backpacks, and Joe Billing from Optron gave a presentation detailing the benefits of using hybrid data capture tools. The most popular presentation was given by Afgen’s Arné Coetzee who spoke about cloud-based processing accuracy for drones. During the meeting there was also discussion regarding the reports that had been tabled from the North West, Gauteng and Mpumalanga Surveyor-Generals (SG) Offices. The difficulties arising from the SG Offices being under-resourced and under-staffed were debated particularly with regard to the North West SG Office. It was pointed out that for the time being the only solution is for the SG offices to work more effectively and for surveyors to submit higher quality plans to the SG offices.